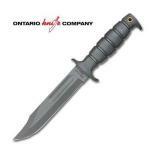 Ontario Knife Company developed many bayonets and survival knives for the U.S. Armed Forces, including the often-copied M-9 bayonet which also became a favorite survival tool for civilian outdoorsmen. Ontario Knife Company’s military knives frequently use an all-purpose design suitable for camp and field purposes and aren’t always restricted to military users. One of their more popular products is a brand of kitchen cutlery you probably wouldn’t associate with OKC at all. Even Ontario Knife Company isn’t certain of all the details of the company’s beginnings, in Naples, New York, in 1889. Three founders — William B. Ensworth, Charles Albert Brace and William Maudsley — were certainly involved but others may have participated. The first production efforts took place in a waterwheel-powered mill, and the company’s first knives rolled out to buyers on peddler’s pushcarts. An old sawmill at Cadiz became the company’s second home in 1902 when Ontario Knife Company first incorporated. Empire State Cutlery Company bought out the first owners of OKC in 1904, shifting the assets of both firms to a new location in Franklinville, New York, in 1905. James A. Chrestensen worked his way to the company presidency in 1923 and began the “Old Hickory” line of kitchen cutlery. Servotronics acquired ownership of Ontario Knife Company in 1967 and added Queen Cutlery to its holdings in 1969. Servotronics divides product types between the two divisions, leaving folding knives to Queen Cutlery and assigning most fixed blade production to OKC. The M7, M9, M1942 Machete, MK3 MOD 0 Diver’s Knife, and the USMC OKC-3S Bayonet are all well known examples of OKC’s earlier military knives. 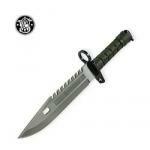 OKC also built the USAF Survival Knife worn by pilots and the Aircrew Survival Egress Knife issued to Army flight crews. The ASEK gives crash survivors the necessary tools for cutting, smashing and sawing their way out of downed aircraft and makes a sensible item for ground travelers as well. The ASEK includes handy holes for lashing the knife to a spear shaft, and an insulated handle in case you cut into an electrified wire. 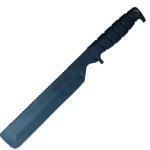 A less intimidating version of the OKC survival knife was recently developed especially for civilian outdoorsmen. 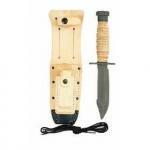 The military-grade Ranger Bush Afghan Knife covers a full list of survival, hunting and camping needs. If you’re still looking for a rugged set of kitchen prep knives in razor sharp high carbon steel, you’ll find 1095 high carbon blades in all of OKC’s “Old Hickory” kitchen knives.